Unitus Ventures (formerly Unitus Seed Fund) invests with a Profits and Values approach in startups innovating for the masses in India. We exclusively invest in early-stage high-growth potential startups that are increasing access to improved livelihoods and/or live-improving goods/services. Some people use the term “base of the economic pyramid” or “BoP” to refer to what we call “the masses” in India. 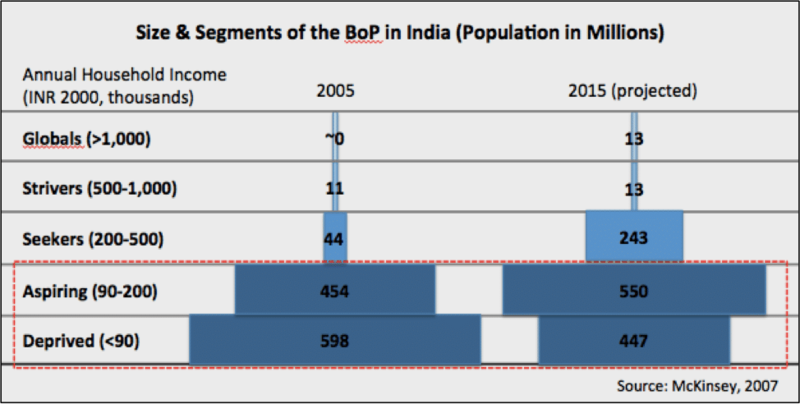 Who qualifies as the BoP masses in India? 1) BoP comprise the 1.05 billion people in India (5 out of 6 Indians) who live on an annual household income of less than INR 200,000 as of 2005. This is equivalent to less than INR 16,667 monthly household income. By 2015, size of the BoP is projected to be 997 million, still nearly 80% of the population. Please read on if you would like to better understand our findings and conclusions. Here is our previous BoP in India analysis. Defining BoP in India is surprisingly challenging. The chart below samples a few of the recent methodologies for determining BoP. The estimates of BoP population in India range from 335 million to 1.05 billion people. 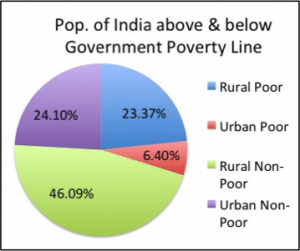 On the low-end of the spectrum lies the official Government of India poverty line number, which assumes income of less than INR 32 per day in urban areas and INR 26 per day in rural areas and accounts for 30% of the total population. (This measurement has been publicly criticized for being unreasonably low). 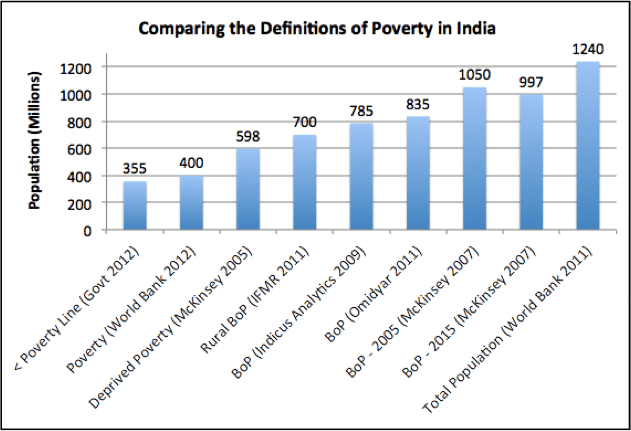 On the upper-end is data from a 2007 McKinsey Report on The Rise of India’s Consumer Market, which includes a broader definition of BoP and is the number we have selected for defining BoP. The base of the economic pyramid is by far the largest percent of the population and market in India. The McKinsey report states that as of 2005 1.05 billion people (or 5 out of 6 Indians) were BoP, living on an annual household income of less than INR 200,000 per year or 16,667 per month. While economic growth and innovative interventions are fueling some improvements and a growing middle class, the report projects that the BoP will still account for 78% of India’s population or 997 million people by 2015. We use this definition of BoP because it not only measures households who are unquestionably living in poverty, but also includes families who have the potential to lift themselves out of poverty and into the middle class. Unitus Ventures (formerly Unitus Seed Fund) aims to impact both of these BoP segments, which the report defines as deprived poor and aspiring poor. At the lowest level of the base of the economic pyramid are those living in abject poverty. The households in this segment of India’s BoP lack access to the most basic necessities, benefit from government welfare interventions, have little or no disposable income, and can best be served by investments Unitus Ventures (formerly Unitus Seed Fund) makes into startups improving livelihoods, such as Caravan Craft, whereby the BoP benefit from increased income earnings. This segment includes what Unitus Labs calls the Ultra Poor (earning less than $1.25/day) and is defined by the McKinsey report as households earning less than 90,000 rupees per year or less than 250 rupees per day. The aspiring poor are households earning between 90,000 to 200,000 rupees per year. These households lack access to many basic necessities, as well as quality sanitation, healthcare, and education. Huge opportunities exist to provide affordable life-changing services to this segment of the BoP, because they have more disposable income and twice the aggregate consumption of the extremely poor. The aspiring poor can best be served by Unitus Ventures (formerly Unitus Seed Fund)’s investments into affordable, quality education like Hippocampus Learning Centres and basic necessities and agricultural support. Most statistics for BoP focus on one general number for household income, but with a growing urban-rural divide, one-size does not fit all in India. In 2012, urban Indians outspent their rural counterparts by 87%, and the costs of housing, food, and transportation vary too. The differences between rural and urban expenses are important to entrepreneurs because a product targeting BoP could be considered affordable in one region, but out of reach in another. Alternatively, similar products with different prices can both target the same amount of BoP benefit. Take the example of Hippocampus preschools in rural Karnataka, which charges only 290 rupees per month, compared to Sudiksha preschools in urban Hyderabad, which cost around 400 rupees per month – both are preschools targeting BoP, but since operating expenses vary from cities to villages, pricing differs too. The Government of India adjusts for urban-rural differences by creating two poverty line thresholds: less than 32 rupees per day in urban areas and 26 rupees per day in rural areas. On average, the NSSO found that the income of an urban Indian household is almost twice that of rural counterparts. To more accurately reflect the urban-rural BoP divide, we define BoP as less than 300,000 rupees per year for urban households and less than INR 160,000 per year for rural households based on the assumptions that urban households are 30.5% of the population and earn 91% more than rural households. We have not estimated how this would shift the overall estimate of India’s BoP population, but at Unitus Ventures (formerly Unitus Seed Fund), our team considers these urban-rural income disparities when analyzing companies’ BoP reach. Although these income levels may seem high, keep in mind that this is just the uppermost limit and most the majority of households still fall under the INR 90,000 per year mark. Arguably two omissions from this update are that we have not used “less than $2 a day” as the marker of BoP and we have not shared income levels in terms of US dollars. Although the World Bank’s poverty level of “less than $2 a day” is well known and widely accepted, it is also static and outdated – it refers to the purchasing power parity (or “PPP”) value of the US dollar in 1990 – making it misleading and irrelevant today. Additionally, despite extensive economic development research, experts still debate the best way to convert between US dollar (also referred to as the international dollar) and local currencies. Since Unitus Ventures (formerly Unitus Seed Fund) currently invests only in companies with primary operations in India, we find it most accurate and efficient to think about income levels in terms of Indian rupees. But at the end of the day, our BoP threshold is slightly higher than $2 a day per person for an average household size of 5 people. If you still want to compare Indian rupees to US dollars, you can divide by the PPP exchange rate, which represents the amount of local currency required to buy what $1USD would buy in the US market. The PPP exchange rate was 14.56 in 2000, the year that the McKinsey report references.